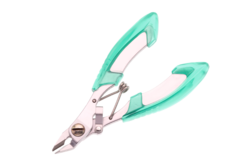 Our product range includes a wide range of diagonal nippers, stainless steel palm nipper and stainless steel nipper. Diagonal Nippers with cushioned grips for cutting Copper 7 Alumunium conductors upto 2.0 dia. Application Suitable for electrical work by electricians and other tradesmen primarily for gripping, twisting, bending and cutting wire and cable. Brand Name Multitec Handle Material Cellulose plastic Item Weight 45 g Material Type Carbon steel Model 011 SS Packaging Dimension (LxBxH) 11 x 5.5 x 1.5 cm Size 110 mm TSIN T014000997 Warranty No Warranty Warranty Terms Conditions Against manufacturing defects only. Key Features Strips insulation fast with no wire damage. Blades are specially heat treated for long life. Stainless Steel Nipper 115mm. cut wires from 0.8 to 1.2mm. Looking for Cable Nippers ?